Most of us are not lucky enough to have authentic Presidential antique china in our collections, especially George Washington's Presidential Dinner Service, honoring the Cincinnati Society. The Cincinnati Society was the nation's first patriotic society founded in 1783. George Washington was the president of the Cincinnati Society until his death in 1799. The purpose of the Cincinnati Society was to honor the ideals of the American and French officers who fought together in the American Revolution. It was named after Cincinnatus, 519-430BC, who served Rome as a dictator when they needed him because of an invasion, and who voluntarily gave back his power two weeks later to the Roman Senate after the invasion was over. He was thought of as a man of virtue who served the greater good of his country. In 1783, George Washington was thought of as being the Cincinnatus of his time, as he was recognized for his service and self sacrifice for his country. He also voluntarily left his position of Commander and chief of the Continental army when the American Revolution was over. The Cincinnati Society still exists today in Washington, D.C.. On January 7, 1789, George Washington was elected the first president of the United States. 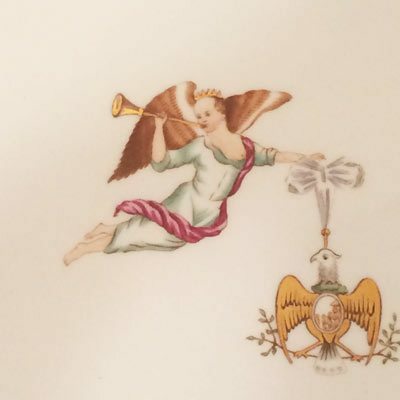 The emblem of the Cincinnati Society is a female with wings blowing a trumpet, holding a ribbon attached to the badge of the society in her hand. The badge of the society is an American bald eagle. American bald eagle badges were worn by many officers who fought in the American Revolution. In 1775, Samuel Shaw and General Henry Knox, both members of the Cincinnati Society, set out on a ship, the Empress of China. This was the first ship to go to china to enter the China Trade. 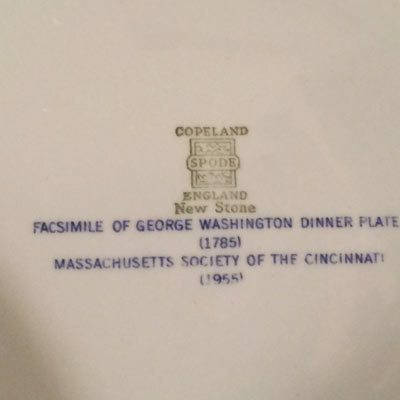 The George Washington China Service, the Cincinnati Society Service, was originally made in Jingdezhen, China, where most of the Chinese Export China was being made. 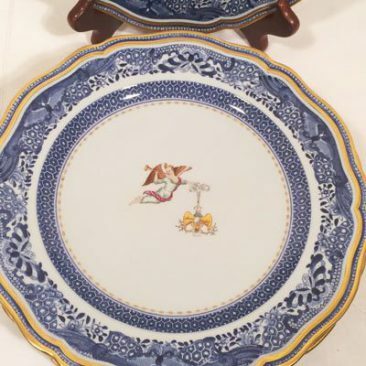 It was originally painted with an under glaze blue border without a center medallion. Shaw had a Chinese painter in China paint the insignia of the Cincinnati Society on the center of each piece. The service was originally 302 pieces including a tea service, a breakfast service and a dinner service. Shaw brought it back to New York on the Empress of China. It was in New York where George Washington found this Cincinnati Society Service. He paid a company one hundred and fifty dollars for the 302 piece set, which was considered very expensive at this time.This was to be our nations first presidential china service. This set was used by George Washington for entertaining his guests at his three homes in Mount Vernon, New York and Philadelphia. After Washington's death, the presidential service was passed on to his grandson Parke Curtis. It was then used at the Arlington House which belonged to the Confederate General Robert E. Lee. After the civil war, a lot of Washington's china service had been broken and damaged during its removal from General Robert E. Lee's Arlington House by the Union soldiers. What was left of the Washington service became the property of the government at that time. When William Mckinley became president, he ordered the return of what was left of this dinner service to Mary Curtis, daughter of Robert E. Lee and Mary Anna Randolph Curtis. In 1928, Henry DuPont, the founder of The Winterthur Museum bought sixty pieces of the George Washington's Cincinnati Society set from the descendants of Mary Curtis, They are still displayed at the Winterthur Museum on the 5th floor. This is where the majority of the George Washington Cincinnati service is today, Some pieces are at Mount Vernon and others may be found in private institutions. In 1955, the Cincinnati Society asked Spode China to make two hundred dinner plates that looked exactly like the George Washington presidential Cincinnati Society Service. They used the stone china which has a grey blue glaze to imitate the Chinese Export Porcelain of the original set. One of the members of the Cincinnati Society lent Spode an original piece of the Washington service, so they could make a copy as close as they could to the original. The under glaze blue border, which was originally painted was copied with an engraving. The original engraving of the border was not accepted by the Cincinnati Society because it did not have the imperfections of the original service. They had to do the engraving of the border over again. The original Chinese George Washinton's Cincinnati service had a double ridge edge. Spode had never made a double ridge edge before. They had to make a new shape to do this. The Cincinnati Society emblem was printed and then it was gilded and painted by hand. I am lucky enough to have a set of twelve Spode 1955 dinner plates, which are a wonderful copy of George Washington's Presidential Cincinnati Society china. Please see the pictures above to fully appreciate these historical plates. Now you will understand the story of the Cincinnati Society and the history of the Presidential George Washington Cincinnati Society dinner service.